Last month, I had the privilege of speaking at INBOUND 2017. I can still barely believe it! It was a whirlwind experience, and I’m still processing the awesomeness of getting to stand up in front of over 1,000 people (twice!) and share with them the top 10 things we’ve learned from doing over one hundred Website Throwdowns. As I think about that week, there are three lessons that I learned from this experience I’d love to share with you or any reluctant public speaker. When HubSpot announced the 2017 Call for Speakers was open, the IMPACT team got together to decide who would apply and for what topic areas. Now, if you had asked me after that meeting, “What are the 10 things you’ve learned from doing over a hundred website throwdowns?” I would have told you that I had no idea. What I did know is that there was a ton of material for me to pull from, and those 10 things were out there just waiting for me to find them. Then came the hard part -- submitting the application; and this is where I learned my first lesson: Don’t question yourself; just do it. While I’ve spoken in front of people before, it’s never been anything close to INBOUND. I had zero videos of myself speaking in front of people, which is what the application asked for. I almost gave up on all of it right then. Until I remembered that IMPACT had just set up a blue screen with fancy lighting in our training room and decided, what the heck, I’ll record my own video! While it wasn’t exactly what the application asked for, I put myself out there and show the folks at INBOUND what I was all about. Impostor phenomenon is real, people and it hit me hard while I was filling out my application. 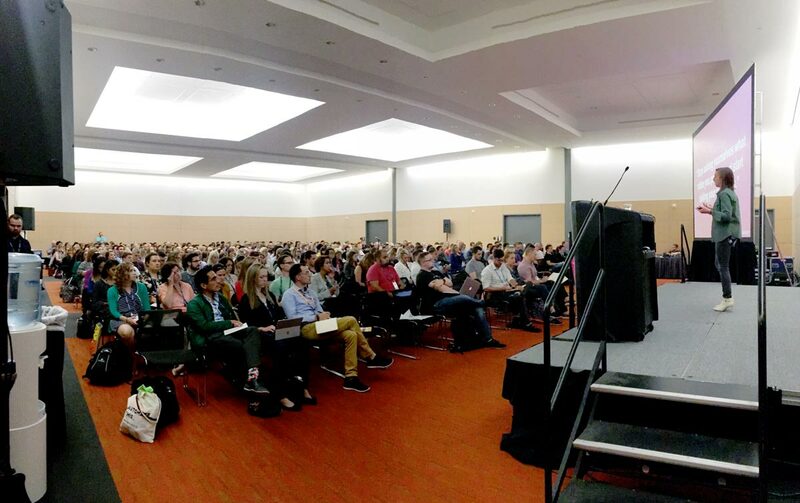 There are hundreds, probably thousands, of people that apply to speak at INBOUND. Why would anyone pick me? My LinkedIn profile isn’t that impressive. My previous speaking experience is limited. There’s no reason anyone would trust me to do this well. But in the end, they did. I can’t tell you that I’ve totally overcome this mentality. I struggled with it throughout the INBOUND speaking process and I’m sure I’ll continue to, but, I have to give it my IMPACT teammates here for helping me power through it. So many IMPACTers encouraged me to go for it, and so I did! If you’ve ever considered speaking at a conference or event, you’ve probably had some similar thoughts, and that may have stopped you from applying altogether. My advice to you is (surprise…): JUST DO IT! What’s the worst that could happen? You don’t get accepted? Are you really going to let the possibility of rejection keep you from the possibility of something amazing? The truth is, I wasn’t freaking out at all. It felt natural and fun to get up there and do it in the end. And that’s because of one thing: preparation. I found out I was accepted to speak at INBOUND on April 11th. That gave me over five months to prepare for my session. Seems like a long time, right? Well, it was. A little too long, actually. I felt like I had so much time to prepare that it kept me from getting going. Weeks would go by that I didn’t give my upcoming talk one thought. Then moments of panic would come on suddenly - Oh gosh! I’m wasting time! I need to make my deck! I need to make my outline! I need to get moving! Ultimately, I didn’t prepare perfectly. For the few months leading up to INBOUND, I “prepared” sporadically. If I saw a free hour on my calendar during the week, I’d block it out to work on my deck or do research, but I could’ve been more diligent. The INBOUND team gives specific deadlines for submitting drafts of presentations decks, so I used that as my timeline for preparing the pieces of my talk, and made sure I hit every deadline they gave me, but it wasn’t until September hit (the month of) that I really kicked it into gear. Something in my brain turned on as soon as September 1st rolled around - I knew it was crunch time and that INBOUND needed to be one of the highest things on my priority list. 1. I got myself a Speaking Champion. A Speaking Champion is someone who will spend time helping you get ready, listen to your presentation as many times as it takes, and provide constructive feedback for making it better. For me, this was my husband, Matt. Bless his heart, Matt sat through my entire 45-minute presentation at least four times in the course of eight days. Each time, he took notes and gave me actionable feedback on what I could improve. It was a sacrifice for him, but made a world of a difference for me. 2. I did a dry run with my IMPACT Fam. The most nervous I was through the entire INBOUND speaking process was during a dry run in front of 10 of my coworkers. I knew that if they liked it, the general public would too, but I also knew that they would give me honest feedback that might be hard for me to hear -- and they did. After the dry run and receiving feedback from everyone, I felt like I had gotten hit by a bus, but I knew that my coworkers’ feedback was going to take my talk to the next level. And it did! 3. I got outside speaker coaching. We at IMPACT are lucky enough to have a friendship with one of INBOUND’s most popular speakers - Marcus Sheridan. When Marcus offered to give the INBOUND speakers from IMPACT a quick coaching session, I knew this was the last piece of the puzzle for me. Marcus’ perspective and advice after doing hundreds of speaking engagements was invaluable, and helped me perfect my presentation deck and own it. Because of these three things, when I got up on stage at INBOUND I felt more excited than nervous, and more happy than afraid. As I began to speak, I didn’t even have to think about what I was going to say. I was ready. Speaking or presenting at an event isn’t just about the experience of the event itself, it’s also about the ripple effect that it can have on you and your organization. As amazing as the two 45-minute blocks I spent speaking at INBOUND were, what was more amazing were the minutes, hours, and days afterward. In the minutes after my sessions, I got to meet so many people who were excited about and appreciative of the information and thoughts I shared. What?!?! That can’t be real. And to think I almost didn’t apply because I doubted that I really had something valuable to offer. In the hours after my sessions, many people visited IMPACT’s booth to sign up for their own Website Throwdown and to hear more about how IMPACT could help their organization improve their website and marketing. Then, in the days after my sessions (I’m still living ‘em! ), I’ve had doors open for new speaking opportunities directly from my talks at INBOUND. I was able to connect with other speakers who are experts in their respective fields and grow my own professional network. Not only that, but I’ve learned so much about myself. I learned that I can do big things and that I have value to offer those around me. I’ve learned that Impostor Phenomenon is real and is unrelenting, but pushing through it pays off big time. I’m still riding the wave of momentum that speaking at INBOUND gave me, and now I can’t imagine not having done it. Do you want to try speaking but feel like you have nothing to offer? Do you feel like there’s no way you’ll get chosen over all of the other people in the running? Take it from someone who’s been there - if you just do it, and prepare well, you’ll be able to ride the wave of your first speaking engagement for the days and months to come!